Journey through Viet Nam and capture the essence of this beautiful country. From historic Ha Noi to the economic hustle of modern Ho Chi Minh City; from the mystical limestone peaks of Ha Long Bay to the Imperial City of Hue and on to the rugged northern mountains and the intricate waterways of the Mekong Delta, you will gain an extensive insight into Viet Nam. It is a journey which takes you through some of the most stunning scenery in Asia and it will leave you with a deep appreciation for the country, its people, culture and history. On arrival at Noi Bai Airport, you will be met and transferred to your hotel. After a welcome drink and tour briefing enjoy a performance of Viet Nam’s unique traditional Water Puppetry. Today tour President Ho Chi Minh’s Mausoleum and his House on Stilts, the One Pillar Pagoda and the Temple of Literature (Viet Nam’s first University). The afternoon is free to visit the Old Quarter with its 36 guild streets or to stroll Ha Noi’s boulevards and enjoy a coffee beside Hoan Kiem Lake. Travelling to Mai Chau, you pass through a region of spectacular limestone mountains and tea plantations. Spend the night in a White Thai villager’s house-onstilts and experience their wonderful hospitality, traditional dancing and rice wine. Leaving Mai Chau and drive through the rural countryside to the 10th Century capital of Hoa Lu and enjoy a journey by rowboat amidst the limestone outcrops to ancient temples and the magnificent grottoes of Tam Coc before travelling on to Hai Phong. In the morning, travel by hydrofoil to Cat Ba Island, visiting the National Park and walk a trail through native rainforest to a spectacular lookout on the limestone peak. There is also time to swim at Cat Co beach and taste the freshest seafood at a beach side restaurant. After breakfast, you board your private boat and cruise gently through the magnificent islets of Ha Long Bay, exploring fascinating caves and swimming before arriving at the harbour. Your bus will take you to Ha Noi, stopping at Dong Trieu ceramic village, where the centuries old secrets of this traditional art are revealed. This morning is free to discover Ha Noi’s colonial charm, rich history and bustling markets at your own pace. Or simply relax by the pool of the hotel before checking out of the hotel and driving to Ha Noi Railway Station for your overnight Reunification Express Train journey to Hue. Arriving in Hue in the morning, enjoy a short rest before cruising the Perfume River to Thien Mu Pagoda, Viet Nam’s oldest and most revered Pagoda. Sailing on, you arrive at the majestic and serene tomb of King Ming Mang and tour its beautifully set out grounds. Walk the cobbled paths through the grounds of the imposing Imperial Citadel is followed by a journey over the breathtaking Hai Van Pass to Da Nang with a visit to Museum of Cham Sculpture before continuing on to the old merchant town of Hoi An. 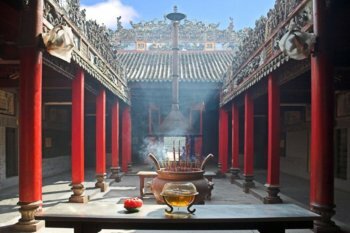 This morning tour Hoi An’s restored shop houses, Chinese Assembly Halls and shared water wells before travelling down Highway One through landscapes filled with lush rice fields and spectacular coastal scenery to Qui Nhon for our overnight stop. Passing dramatic granite cliffs, your road takes you through the picturesque beach and fishing village of Dai Lanh to Nha Trang. You are free to enjoy the beachfront and swim or relax or take advantage of a massage and manicure beneath the swaying beachside palm trees. Visit the 9th Century Po Nagar Tower and tour the Oceanographic Institute’s extensive collection of aquatic flora and fauna. Then cruise the island dotted turquoise waters of Nha Trang Bay and enjoy superb seafood lunch at Mieu Island before heading back to the mainland. Leaving the golden sands of Nha Trang behind you visit the remarkable Cham Towers of Poklon Garai before ascending into the mountains of the South Central Highlands. Panoramic views of the coastal plains, pine clad mountains and crisp cool air herald your approach to the scenic former French Hill Station of Da Lat. Explore Da Lat’s stairways and cobbled lanes, colourful central market, beautiful flower gardens, tranquil lake and grand French villas. As you descend from the ‘City of Eternal Spring’ you pass plantations of tea, coffee, bananas and rubber before entering the frenetic bustle of Ho Chi Minh City. Today explore Notre Dame Cathedral and the former US Embassy. On entering the Chinese District of Cho Lon, home to the largest wholesale market in Viet Nam, the energy is palpable and a respite from the frenetic activity is to be found within the ornate walls of Chinatown’s oldest Pagoda, Thien Hau. Drive to Tay Ninh, near the Cambodian border and witness the hypnotic noontime service and eclectic architecture of the Cao Dai religion. In the afternoon explore the phenomenal underground tunnel network and former Viet Namese soldiers’ stronghold at Cu Chi, before returning to Ho Chi Minh City. Heading south to Vinh Long, board a motor boat and travel up the Mekong River to explore Cai Be’s Floating Market. A visit to the industries and orchards of Vinh Long is followed by a lunch of local specialties before continuing your journey to Can Tho. A morning boat ride take you to the remarkable floating market at Cai Rang, continues up the leafy waterways to a fruit orchard where you can sample delicious tropical fruits and learn about the Delta‘s way of life from your friendly local hosts before returning to Ho Chi Minh City.